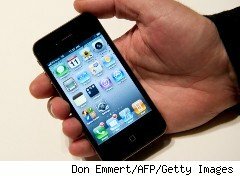 Verizon is allowing some AT&T customers to trade in their iPhones for credit when they buy a new Verizon iPhone 4 and sign up for a two-year contract, although the trade-in value isn't as much as they'd get by selling their old phones on the secondary market. A quick glance at Gazelle.com, where used iPhones hit a premium price on Jan. 12 after the announcement that Verizon was selling iPhones, showed on Thursday night that various iPhones in excellent condition could be sold on Gazelle for $15 to $80 more than what Verizon is offering in credit toward a new phone.The Gazelle prices dropped from what they were on Jan. 12, except for the iPhone 4 16GB, which went up from $345 to $360 -- or $80 more than the $280 Verizon is offering. A $325 early termination fee, or ETF, will eat all or most of the savings. You can't get out of a phone contract with AT&T or anyone else without giving some blood. And if Verizon is only offering trade-in credit, that $325 fee, or whatever's left to pay on your contract, must still come out of your pocket. According to MacRumors.com, Verizon has offered a Feb. 3 pre-sale to its corporate customers who want an iPhone 4. Everyone else has to wait until the Feb. 10 public launch date. The website didn't know if the trade-in deal for AT&T customers extended to non-corporate account customers. If it does, it's not a deal compared to selling your own phone for cash, although it does take a lot of headache out of having to do that transaction. It's a lot easier to walk into a Verizon store and trade in an old iPhone for a new one. The trade value is better than Verizon's regular trade-in program, according to MacRumors. Other secondary buyers of iPhones include: EcoSquid, which researches many recyclers for the best price; and NextWorth, which on Thursday night was offering $323.50 for a "like new" iPhone 4 16GB.